Turning the tables on the conservative Senators looking to please their donors and bring back an old Amnesty bill, Trump is now using public pressure to force these men to drop their crusade to throw the borders open and to accept his pro-American immigration strategy. In a meeting with Sen. Lindsey Graham, who has been pushing a “Gang-of-Eight” bill along with other pro-Amnesty Senators, the GOP are looking to turn the heat up on Trump to soften him on immigration before they then speak to Democrats to develop a bipartisan immigration bill. Sen. Jon Cornyn with the Republicans was quoted on social media as being interested in finding a chink in Trump’s armor to give them the ability to open him up to concessions. Cornyn says Judiciary R’s meeting w Trump tmrw on DACA. As we noted in 2015, the Gang-of-Eight Amnesty bill was championed by Marco Rubio, who earned his Senate seat because he was in favor of border security and halting Amnesty,> It also included conservative supporters Sen. Jeff Flake, Sen. Lindsey Graham and Sen. John McCain. Democrat Senators who also supported the bill included Sen. Robert Menendez of New Jersey and Sen. Chuck Schumer. The bill included measures to allow a path to citizenship for aliens already in the country and to give more options for Americans to import low-skilled workers to do agricultural work for cheap. Since he arguably won on getting rid of lottery visas and chain migration, it is doubtful that the priorities that were worked into the Gang-of-Eight bill, whose backers are still in the Senate, will come to fruition. But the meeting didn’t go quite as smoothly as the pro-immigration Senators wanted, because Trump was surrounded by cameras and was able to speak directly to Americans, again urging the need for a “physical border wall” and that it’s a wall to “keep out deadly drug dealers, dangerous traffickers and violent criminal cartels.” He also rehashed his beliefs on chain migration, calling it a “total disaster” and reminded the media of the recent deaths of Border Patrol agents. Trump then complimented Sen. Chuck Grassley who has been working on a bill that reflects the administration’s priorities as well as Sen. Tom Cotton from Arkansas. But as for Sen. Graham, who is a sponsor of the Democrat DREAM Act that would offer 3.25 million illegals fast Amnesty, he attempted to flatter the President by saying that even though “Obama couldn’t do it, Bush couldn’t do it,” he believes The Donald can finally approve of this wacky immigration strategy. 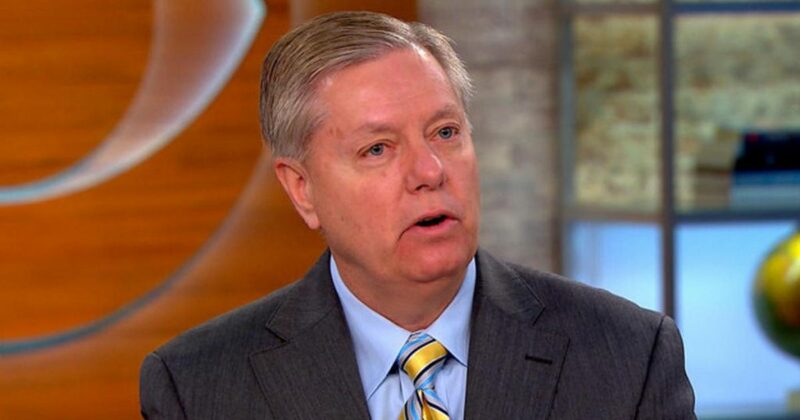 But Trump just said to the media: “Lindsey used to be a great enemy of mine and now he’s a great friend of mine,” in reference to Graham’s previous devotion to Jeb Bush. So, Trump’s on to his tricks. And it doesn’t look like he’s falling for them.